In the nature reserve of the Anina Mountains in South Western Romania lies one of the most curious waterfalls in the world: the Bigăr Spring. 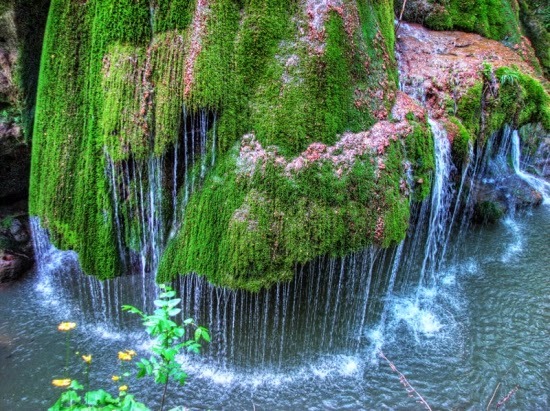 Though it doesn't impress by size or flow, what sets this waterfall apart from others is its peculiar shape - resembling a mushroom tip or a princess' gown - and location: a moss covered extension of a cliff over a small river (Miniş). All these features combined, which directly influence the way water spreads and flows into the river below, and the fact that the waterfall is located exactly on the 45 parallel, being halfway between the Ecuator and the North Pole, have placed it in the top of the most unique waterfalls in the world.